Striker who joined AC Milan in 2011 and was named one of the 100 greatest soccer players in the world by the Guardian in 2012. He signed with Roma in 2016. He made his Italian Serie A debut with Genoa C.F.C., less than two months after his sixteenth birthday. In 2012 he signed an endorsement deal with Nike, appearing in an ad for its Green Speed II shoes. 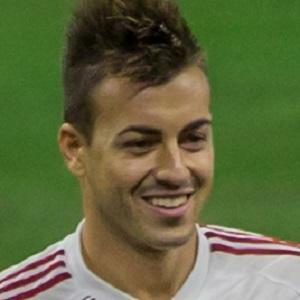 He grew up in Savona, Italy to Lucy and Sabri El Shaarawy. Theo Walcott appeared alongside him in a Nike Speed II ad.